Our DIRECTLY OCEANFRONT condominium at Pelican's Landing has the ocean front view everyone wants when visiting the beach. The SHORE DRIVE condo is on a stretch of beach that is a “FAMILY-TYPE AREA” and located on the first floor which overlooks the beach-side pool, just steps away from beach and ocean. Walk to the beach knowing you can relax while lounging in the beach service chairs and enjoy the umbrella we provide our guest during the “beach season”. The professionally decorated condo was updated with new flooring and furniture during the spring of 2018. The OPEN CONCEPT kitchen, dining and family room allow optimum guest interaction and great views of the ocean. The family room has a full size sofa and additional seating with a 43 INCH FLAT SCREEN TV with a screened in oceanfront porch, great place to have breakfast and watch the sunrise. The kitchen features all new STAINLESS STEEL APPLIANCES, GRANITE COUNTERTOPS and brushed nickel fixtures. The master suite has a comfortable, KING-SIZE BED, new FLAT SCREEN TV and ensuite bathroom featuring GRANITE COUNTERTOP AND brushed nickel fixtures. Two of the bedrooms have twin beds, one having a half-bath. The condo also provides a breakfast bar, full-size washer/dryer, wet bar, cable TV and DVD player in the family room, cable TV in all three bedrooms, screened-in porch off family room, and balcony off master suite. The screened-in porch at the entrance is convenient for storage of beach chairs, toys, and coolers when you return from a busy day at the beach. We are glad to provide our guest with FREE Beach Service umbrella and two chairs during “beach season”, secure WiFi access, linens and NO departure cleaning fee. Pelican's Landing offers two pools, sunbathing decks with chairs, elevators, covered paved parking, grilling areas, children's playground, and direct beach access from the pool deck. NO SMOKING or PETS are allowed in the condominium. Shore Drive is at the end of Lake Arrowhead Drive, just off Highway 17 ('Restaurant Row' area), with convenient access to the Conway Bypass. You are minutes from great golf courses, excellent restaurants, Broadway at the Beach, Barefoot Landing, Pirates Voyage Dinner Theater, Carolina Opry, Tanger Outlet Mall, and other specialty/department stores. All the bathrooms feature granite counters and brushed nickel fixtures. The professionally decorated condo is direct ocean front. The condo is ocean front where you can watch the waves roll in and enjoy morning sunrises! The condo is just steps away from the beach where an umbrella and beach chair are provided during the summer season. Enjoy the ocean front condo and view the relaxing ocean. The condo is directly oceanfront where you can enjoy your coffee and watch the sunrise. The condo is ocean front where you can watch the tide roll in. The complex has two elevators but is on the first floor and easy access - 1 flight of stairs. Professionally decorated condo features an open concept living areas. The Living room has a full size sofa and additional seating with access to a screened in porch overlooking the pool and beach. Fully stocked kitchen has a great selection for cooking great meals at the beach. The open kitchen features granite counter tops, stainless appliances, breakfast bar and views of the ocean. The dining area is open to the kitchen and living areal and has great views of the ocean. Seating for six around a dining table as well as two bar stools at the breakfast bar. (4) New flat screen TV's in living area and all three bedrooms; living area features a 43-inch flat screen. (4) Cable TV is available in the living area and in all three bedrooms. Screened in porch off living area and screeened porch at entrace to store beach items. (2) Two pools. One pool is beach front. We stayed at this lovely rental the week of April 13th. It was very clean and comfortable. Had everything we needed. Washer and Dryer a huge bonus!! 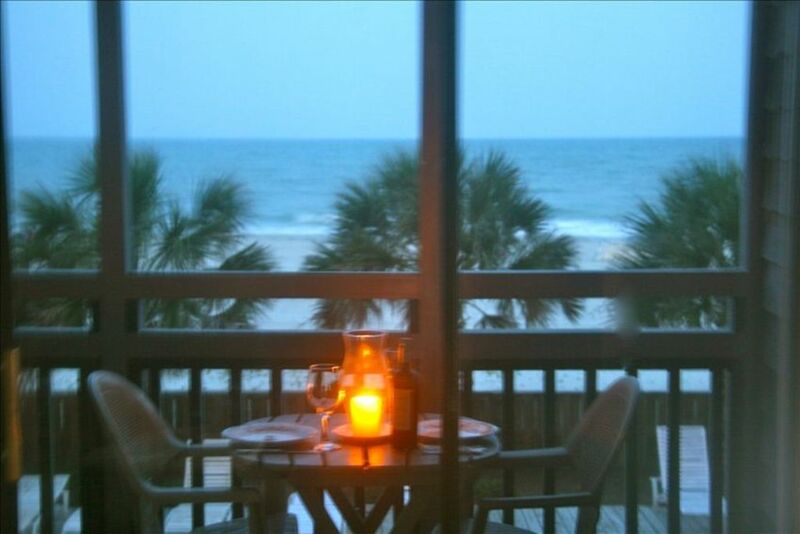 We sat out on the screened in deck a lot enjoying the views and sounds of the ocean. Very peaceful area. My husband enjoyed fishing very early in the morning. Sunrise was incredible. We brought plenty of things to do on the beach. Kite flying, Frisbee, Volleyball, etc. Our last day was a very stormy day but we still got out to eat. I highly recommend Biminis seafood restaurant. Soooo Good. Everything you want is nearby. Eric, the owner got back to us quickly with questions we had. The master bedroom bed was very comfortable. I slept like a baby. Ice. Maker is a huge plus also. We mostly ate out but did have breakfast at the rental. Annie, the housekeeper was also very easy to work with and from the moment I walked in the place, I knew she takes pride in her job. Spotless!! I am looking forward to booking this place again in the future. We could not be more pleased with the condo and location. We had the best view of the beach from the living area and the master bedroom. The décor is very sophisticated, updated and fresh. The condo was clean and had everything we needed for a great visit. The location was wonderful and close to great activities and restaurants. The owners were great to work with and already planning a return visit in the fall. Cannot recommend this condo enough and I know other guest wouldn’t be disappointed either. I wanted to give this condo a realistic review because I rely on others for their recommendations as well. Great place to stay with the family and only steps away from the beach. We will return! When arriving we were very happy to see the layout of the unit and the convenience to the Beach. The screened-in entranceway and front balcony were nice touches to the condo as it served its purpose very well for us. prompt communication between us and the unit owner. If We came back to Vacation again we would keep this unit in Mind for another Stay. This condo will not disappoint. It was spotlessly clean and tastefully decorated. Towels and linens were provided which is nice a nice bonus. We love this area of North Myrtle because it is quiet and has several walkable restaurants like Ocean Annies. I would definitely stay there again. Great location for a family. The condo was very clean and well stocked with linens, utensils, pots & pans, and dishes. Great for grocery shopping and wanting to save money on eating out every night. The location was not overly populated and was near a small inlet that was great for finding small critters with my kids. The condo was directly over the pool so I could allow my older kids to swim and still be able to check on them. There are a couple eateries and shops (even ice cream!) in walking distance. I'd definitely recommend it and would gladly return. WiFi, Iron and Ironing Board, Vacuum Cleaner, Departure Cleaning and Linens available, Beach Service Umbrella and Chairs provided during Beach Season. Linens and departure cleaning are included in rental price. A Beach Service umbrella and two chairs are provided during the beach season from Memorial Day to Labor Day. A $400 security deposit is required for a rental. Please inquire for pricing on monthly and daily rentals.